Total Built-Up Area - 1451 Sq.ft. This single storey house of 1500 Sq.ft. will best fit on a narrow rectangular plot which is mist common to people living in urban locations. The design is also suitable for weekend homes which are based in the outskirt of the city limits. 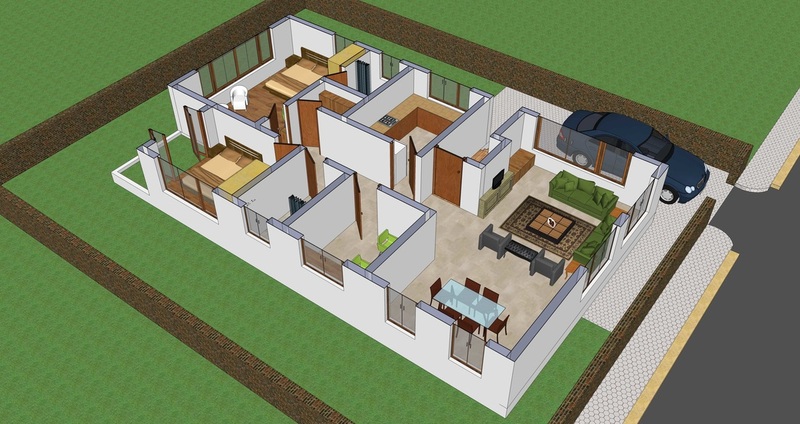 A plot of 50 ft x 72 ft is sufficient enough to make way for this home floor plan. The narrow entrance on the right side of the floor plan makes for a private zone demarcation for private zones of the house and casual entertainment zones of the house for hosting guests, friends and relatives. The living room along with the dining space covers the full breadth of the house and adds on to the effect of a large room from the moment a guest enters the house. The two spaces are demarcated well with furniture and the proximity of the kitchen next to the dining makes it a perfect floor plan. From the entrance door onwards the house is divided into left zone for entertaining guest and the right hand side zone for private areas, like the two bedrooms which have their own bathrooms attached. One of them is a common toilet for other to use. The house also takes a small store into consideration for those unknown requirements and storage spaces which are usually welcomed by the lady of the house. The design is very streamlined with straight clear lines in elevation which gives it a very modern and understated look and feel. This pristine attempt of house design will appeal to families who are used to the luxuries of living in an urban environment.